Black Stag Deli produce their own sausages and salami from the beautiful Langs Beach in Northland. They pride themselves on producing outstanding sausages which are free from preservatives, dyes, soy, flour, rice flour, egg, fillers and dairy products. The sausages are crafted using natural spices and natural casings, and have been made in the way of traditional sausages which has been passed down through the generations. Their deli meats can be purchased online but you can usually find them at the Mangawhai Markets each week. 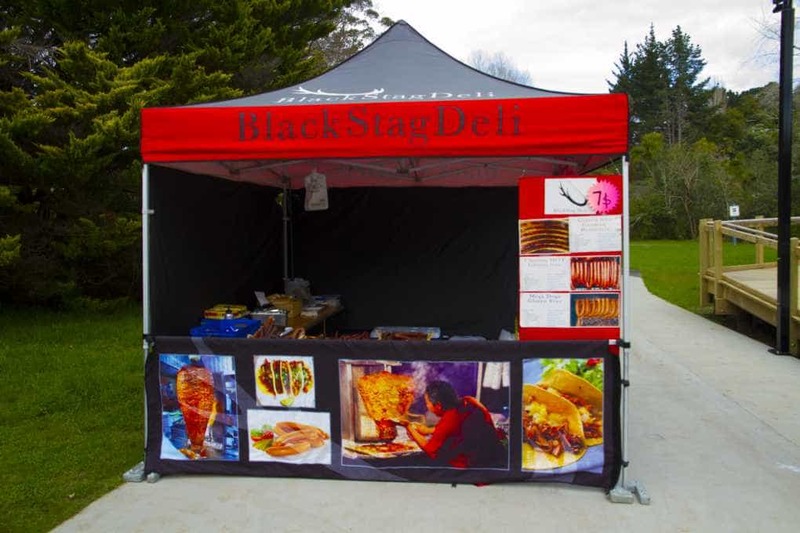 Shade7 have recently supplied another commercial printed gazebo which Black Stag Deli will use at the many events that they work from. Spending each week at the markets, it is vital that the gazebo is easy to carry, setup and pack down, but is also tough enough to endure frequent use and various weather conditions. Shade7’s commercial aluminium gazebo was the perfect solution, offering a light yet tough product. In addition Blag Stag Deli will benefit from the premium polyester being fire retardant, very water resistant and also sun protective, blocking 99% of UV radiation. Black Stag Deli also chose to add some half walls with their commercial gazebo, which have numerous benefits. They provide extra protection from the wind, rain and the sun, while at the same time offering a perfect advertising space. A half wall is also ideal for creating a branded partition which can hide untidy resources and stock. Shade7 Gazebos offer a design service in conjunction with their printing. All of the gazebos roof, valance and wall fabric can be printed on with photo quality graphics, giving you maximum exposure for your brand. Contact Shade7 today to discuss how our printed gazebos can help you.